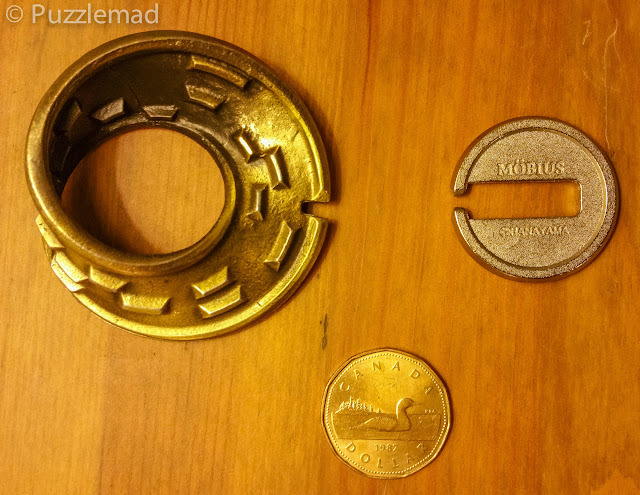 PuzzleMad: Cast Mobius - Mike Weaves His Magic Again! Aloha Kākou once again (Ed - I just lurve that expression). After completing the Euro Falle reviews, I was in a bit of a quandary as to what to write about next. I wasn’t kidding when I said my puzzle collection is modest (Ed - do we believe him? He has reviewed 4 puzzles that I don't own already). Almost everything I have has been well-covered by Kevin and other bloggers. 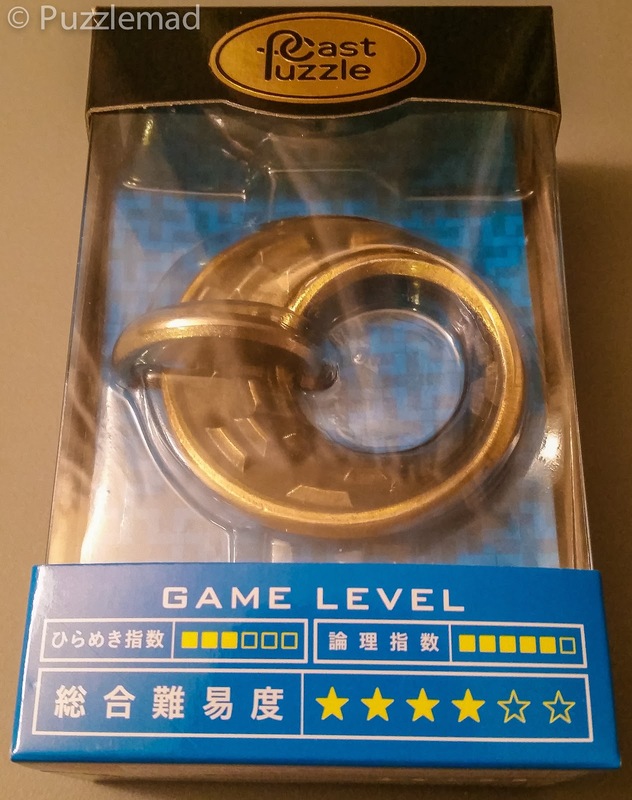 This changed, however, when my friend and fellow puzzler Amanda ordered and received Hanayama’s latest cast puzzle, the Mӧbius. Amanda is quite partial to mazes, labyrinths, and anything route-finding, so she was compelled to get her hands on Mӧbius as soon as possible. Mӧbius is not available in the U.S. yet, and not anywhere outside Japan as far as I know. I haven’t seen it offered by any of the usual retail puzzle sellers so it seems pretty clear that production has not ramped up yet. Amanda ordered her Mӧbius from a Japanese seller on Amazon AND paid for rush shipping. Otherwise it would not have arrived until January. I’m far too lazy to make that kind of effort (Ed - me too!) but I’m really glad that Amanda did because now I have access to it. I don’t know how long it will take for Mӧbius to show up on shelves here in Hawaii, but a one year wait for new release Hanayama’s is not uncommon. Cast Hexagon, for example, is still nowhere to be seen (Ed - it is available here mate). Mӧbius will become widely available from online puzzle retailers in short order, but for this brief moment in time, Mӧbius is an unknown quantity for most puzzlers. So, casting all self-respect aside, I have rushed to get this review typed up and off to my editor/publisher Kevin before anyone else can review it! I’ll admit it is unseemly behavior, but I make no apologies. I am VERY grateful for your unseemly behaviour! Having this all ready for me has helped me plan future acquisitions and has allowed me to cook the Ragu for tonight's Lasagne. Mrs S is getting a little upset with me spending every Sunday afternoon on the computer! As you can see in the video and in the picture above, the cast Mӧbius is indeed a standard Mӧbius strip. But perhaps not an entirely standard one, because the cast Mӧbius relies on a thickened rim to bound its surface maze. The surface of the strip contains projections between which you must navigate to separate the disk from the strip. The disk, for its part, exhibits two projections which will slide around the surface of the strip, on opposing sides (or side? See how confusing it is?) bumping into the maze ‘walls’ and, eventually, out the single entry/exit point. Both “sides” must be navigated simultaneously. Mӧbius is made of cast zinc in standard Hanayama fashion, to which they have applied an antiqued brass finish. The disc is plated with something silvery. Aesthetically, it all works on this puzzle. 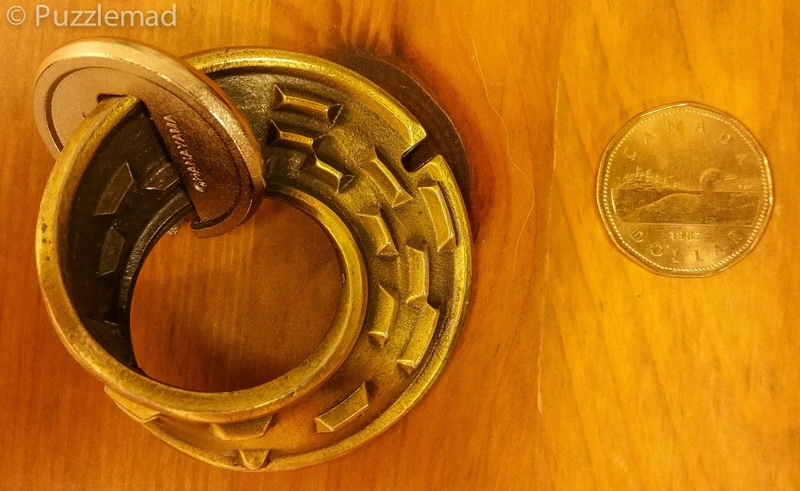 Because I have a number of actual antique brass objects, I always find this finish a little disingenuous. It’s really a pale imitation of well-aged brass, which is beautiful. But I can see why they chose it. Interestingly, the interior of the strip is very dark, almost black. I don’t know if this was intentional or just a function of the manufacturing process. If there was some visual effect intended, I don’t think it works. But what about the puzzle aspect? Always a long lead-in, I know. Here’s the pay-off. Let’s start with difficulty. 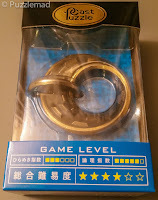 Hanayama have rate Mӧbius as a level 4 in their 6-level system. I find the 4s to be pretty diverse in difficulty. Some present a real challenge, like the Cast Twist, and even when not particularly hard they can be just fun and interesting, like Coaster and Ring. A Hanayama 4 is usually a really good down-time puzzle when you want the fun without the headache. With that in mind, I feel that Mӧbius warrants a level 3 at best. This is not a challenging puzzle by any standard, even as a down-time puzzle. In fact, you will be able to fluke this one in very short order. Despite the infinite strip, the maze is actually quite short and without any particular trick. It is a very straightforward route-finding task. I got the disk off in less than a minute. The second try actually took a little longer (why does that always happen? ), and I got stumped momentarily, but still a quick solve. Reversing the process is quick too, as you would imagine. You might fumble a bit at one juncture and it is possible to forget your ‘direction’ and end up back at the entry point when you didn’t mean to. But ultimately not much of a challenge. So I would say keep your expectations in line with a high 2 or 3 for difficulty. Mӧbius will not keep you occupied for very long. One advantage of such a short maze, though, is that you can fully grok this puzzle. With a little manipulation and careful examination, you can see the path really clearly and see where the designer wants you to go astray. But you don’t need to understand it to solve it, regrettably. You can just fumble around and it will come off in short order. it is based on a cool shape – a Mӧbius strip! Both features caused me to have unrealistically high expectations. So, unfortunately for me, I was left wanting. In the final analysis, simply putting a maze on a Mӧbius strip does not automatically make for an innovative puzzle, even if it is a double-sided maze. But it certain does make for an innovative “looking” puzzle. It does look cool! Can you see the path? Let’s not even get into the related forms - see the pic to the left. Smart people, please start working on this - Kevin is running out of puzzles (Ed - it's true! Whack! Ouch! Sorry dear). If you get nothing else from this review, I hope at least that it allows you to calibrate your personal expectations. Mӧbius is a neat puzzle and I will hand it off to my niece the first chance I get. She will love it. This puzzle is great for kids and non-puzzlers. They will get some challenge and they will very likely get the thrill of solving it. 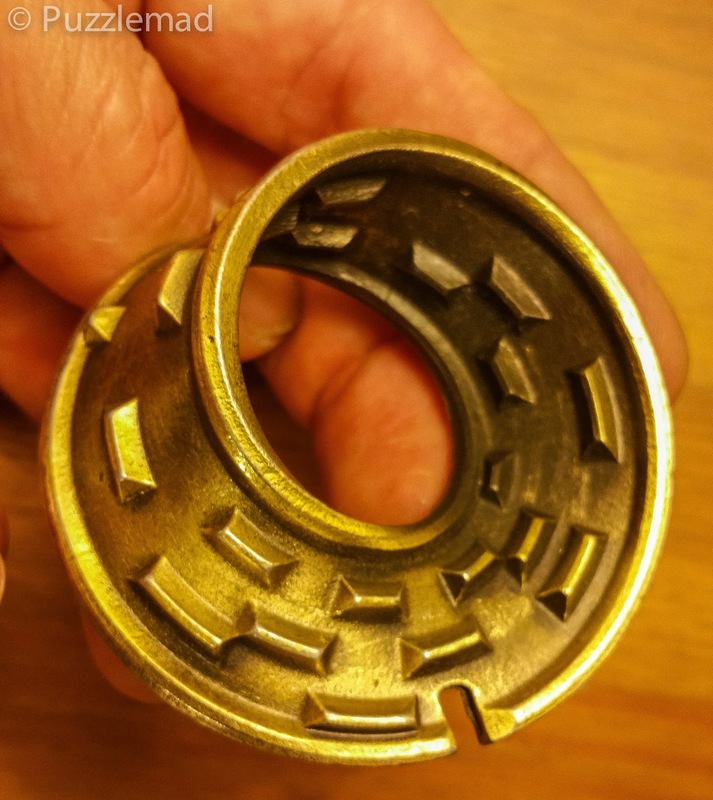 The puzzle is very sturdy, fits great in the pocket, and will look very cool next to your unsolved Cast Vortex (Ed - mine is solved!). There really is nothing out there like it. A unique maze platform to be sure. Unfortunately, you will really have to pay through the nose if you want to own one right now (and you are not in Japan). There will be the usual mark-up, possibly an unfriendly exchange rate, and of course my bane, international postage plus a huge time lag. If that doesn’t deter you, then go for it. Amanda did and I don’t think she regrets it. I don’t regret that she did, because it allowed me to write this review. Thanks Amanda! I owe you one. For all others, just wait until it hits the shelves in your country. Hanayama’s Chinese manufacturers will pump these out by the tens of thousands. Plenty for everyone.